Joining individuals from the space exploration community, the financial sector, and mining and minerals industries, the SRR seeks to bring together interested parties to discuss issues related to the In-Situ Resource Utilization (ISRU) of lunar, asteroidal and martian resources. The Roundtable is a continuing series of such engagements, each designed to strengthen the communication and technical ties between these sectors. The 10th joint meeting of The Space Resources Roundtable (SRR) and the Planetary & Terrestrial Mining Sciences Symposium (PTMSS) will be held in June 11-14, 2019 at the Colorado School of Mines, in Golden, CO. The SRR will be celebrating its 20th anniversary in 2019, so mark your calendars for this special event! See you in Colorado this June! The Commercial Lunar Propellant Architecture study was released on November 1. This study is the result of an examination by industry, government, and academic experts of the approach, challenges, and payoffs of a private business that harvests and processes lunar ice as the foundation of a lunar, cislunar, and Earth-orbiting economy. The final report of the Lunar Polar Prospecting Workshop (LPPW) has been released. The LPPW was conducted on June 14-15, 2018 at the Colorado School of Mines in Golden, Colorado. It was held in conjunction with the 19th Space Resources Roundtable (SRR). The workshop was sponsored by the SRR and the Lunar Exploration Analysis Group (LEAG). The purpose of the workshop was to develop a roadmap for a resource exploration campaign focused on ice deposits at the lunar poles that could lead to industrial scale production of LO2/LH2 propellants within ten years. The 9th joint meeting of The Space Resources Roundtable (SRR) and the Planetary & Terrestrial Mining Sciences Symposium (PTMSS) in collaboration with the Lunar and Planetary Institute (LPI) and sponsored by Advanced Space and Honeybee Robotics was held on June 12-15, 2018 at the Colorado School of Mines, in Golden, CO.
With a record attendance of 172 participants, there were 64 technical presentations and 3 roundtable discussions on lunar, Martian, and asteroidal ISRU activities, as well as the latest economic models, legal and policy contributions, international participation, and private sector involvement in this field. This year, the conference was followed by the Lunar Polar Prospecting Workshop, which was sponsored by the SRR, the Lunar Exploration Analysis Group (LEAG), and United Launch Alliance (ULA). The objective of this workshop was to develop a plan for a prospecting campaign to characterize the ice at the lunar poles. Proceedings and pictures of the conference are now available. Lawrence 'Larry' Taylor, founding member of the Space Resources Roundtable and Director of the Planetary Geosciences Institute at the University of Tennessee, passed away September 18, 2017 at the age of 79. Larry will be fondly remembered as a prolific planetary scientist, as well as a strong advocate for the utilization of space resources. Luxembourg becomes the first European nation to adopt a legal and regulatory framework recognizing that space resources are capable of being owned by private companies. The 8th joint meeting of The Space Resources Roundtable (SRR) and the Planetary & Terrestrial Mining Sciences Symposium (PTMSS) was held on May 1-3, 2017 in conjunction with the Canadian Institute of Mining (CIM) 2017 Convention in Montreal, QC, Canada. Proceedings of the conference are now available. During the SRR/PTMSS meeting this month, ULA outlined its plan to enable a cislunar space economy based on their need for propellant and refueling in Earth orbit. Central to the "Cislunar 1000 Vision" is a reusable upper stage refueled by propellant made from water extracted from the Moon or asteroids. 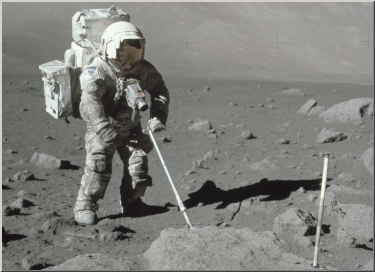 The 7th joint meeting of The Space Resources Roundtable (SRR) and the Planetary & Terrestrial Mining Sciences Symposium (PTMSS) was held on June 7-9, 2016 at the Colorado School of Mines, in Golden, CO.
With a total of 82 attendees, there were 45 technical presentations and 3 roundtable discussions on lunar, Martian, and asteroidal ISRU activities, as well as the latest economic models, legal and policy contributions, international participation, and private sector involvement in this field. The Mars Water In-Situ Resource Utilization (ISRU) Planning (M-WIP) Study has been released. This first-order analysis of supply-side planning from potential water resource deposits on Mars was jointly requested by NASA-SMD and NASA-HEOMD in January, 2016. It followed the strong interest generated on Mars ISRU at the First Landing Site/Exploration Zone Workshop for Human Missions to the Surface of Mars, held in October, 2015. The 7th joint meeting of The Space Resources Roundtable (SRR) and the Planetary & Terrestrial Mining Sciences Symposium (PTMSS) will be held this June 7-9, 2016 at the Colorado School of Mines, in Golden, CO. Given the renewed interest on ISRU activities for the Moon, Mars, and asteroids from space agencies around the globe, the international private sector, academic institutions, and from recent legislation introduced for space-resource commercial exploitation, this meeting will provide a unique and timely forum for discussion of the near- and long-term opportunities in this area. The first International Space Exploration Coordination Group (ISECG) virtual workshop on exploring and using lunar polar volatiles will be held on November 18. A moderator will lead the virtual workshop, supported by a panel of experts on the workshop topic. There will be a presentation to introduce the topic, and then discussion including commentary by panel members, as well as verbal and chat room comments/questions from participants. All members of the scientific and human spaceflight communities are encouraged to participate in the First Landing Site/Exploration Zone Workshop for Human Missions to the Surface of Mars. The workshop will be held October 27 to 30, 2015, at the Lunar Planetary Institute (LPI) in Houston, TX. The purpose of this workshop is to identify and discuss candidate locations where humans could land, live and work on the martian surface. The American Society of Civil Engineers (ASCE) will hold the 15th Biennial ASCE Aerospace International Conference on Engineering, Science, Construction, and Operations in Challenging Environments on April 11-15, 2016 at the Rosen Center Hotel in Orlando, FL. This conference brings professionals together from across the world to discuss issues related to engineering, science, construction and operations in the extreme environments on Earth and in space. The conference is sponsored by the Aerospace Division of the American Society of Civil Engineers (ASCE) and administered by Missouri University of Science and Technology. The 6th joint meeting of The Space Resources Roundtable (SRR) and the Planetary & Terrestrial Mining Sciences Symposium (PTMSS) was held on May 10-13, 2015 in conjunction with the Canadian Institute of Mining (CIM) 2015 Convention in Montreal, QC, Canada. Besides 20 technical presentations, 2 roundtable-discussion sessions, and a technology demonstration exhibit booth, there was a keynote presentation by Erick Dupuis, Head of Robotics at the Space Exploration Development office of the Canadian Space Agency. The Planetary & Terrestrial Mining Sciences Symposium (PTMSS) and the Space Resources Roundtable (SRR), will convene their sixth joint meeting on May 10-13, 2015 in conjunction with the Canadian Institute of Mining (CIM) 2015 Convention in Montreal, QC, Canada. This year's meeting will include keynote speakers, technical presentations, and 3000 ft2 of technology demonstration space on the exhibit floor accessible to all the 8,000-10,000 delegates of the CIM conference. The 5th joint meeting of The Space Resources Roundtable (SRR) and the Planetary & Terrestrial Mining Sciences Symposium (PTMSS) was held on June 10-11, 2014 at the Colorado School of Mines, in Golden, CO. Besides 20 technical presentations and 2 roundtable-discussion sessions, there were presentations from Planetary Resources, Moon Express, Deep Space Industries, and Shackleton Energy, four private sector companies with ongoing plans for exploration and extraction of space resources. Deltion Innovations Ltd., a spin off of the Innovation and Prototype Development Department of the Northern Centre for Advanced Technology (NORCAT), launches its operations in Sudbury, Ontario, Canada. Deltion Innovations focuses on the development of space mining techniques and technologies, as well as in the terrestrial mining robotics field by facilitating technology transfer between the two sectors. The Planetary & Terrestrial Mining Sciences Symposium (PTMSS) will now be carried forward under the Deltion banner. The 4th joint meeting of the Planetary & Terrestrial Mining Sciences Symposium (PTMSS) and the The Space Resources Roundtable (SRR) was held on May 5-8, 2013 in conjunction with the Canadian Institute of Mining (CIM) 2013 Convention in Toronto, Ontario, Canada. Besides technical presentations and open-discussion sessions, there were keynote speakers from Planetary Resources, Moon Express, Deep Space Industries, and Shackleton Energy, four private sector companies actively engaged in exploration and extraction of space resources. In addition, conference attendees had the opportunity to see more than a dozen booths with space mining equipment and technology, which shared the exhibit floor with hundreds of traditional mining companies. Dr. Angel Abbud-Madrid, Director of the Center for Space Resources (CSR) at the Colorado School of Mines (CSM) has been named the new President of the Space Resources Roundtable (SRR) effective March 1, 2013. He replaces Robert Wegeng, Chief Engineer at the Pacific Northwest National Laboratory (PNNL), who has been serving as SRR President since October, 2008. The Planetary & Terrestrial Mining Sciences Symposium (PTMSS) and the Space Resources Roundtable (SRR), will convene their fourth joint meeting on May 5-8, 2013 in conjunction with the Canadian Institute of Mining (CIM) 2013 Convention in Toronto, Ontario, Canada. The 3rd joint meeting of The Space Resources Roundtable (SRR) and the Planetary & Terrestrial Mining Sciences Symposium (PTMSS) was held on June 4-7, 2012 at the Colorado School of Mines, in Golden, CO. Besides 40 technical presentations and open-discussion sessions, there were keynote speakers from Planetary Resources, Moon Express, and Shackleton Energy, three private sector companies that have recently announced plans for exploration and extraction of space resources. In addition, conference attendants had the opportunity to observe the Transit of Venus and to tour the lunar regolith simulant manufacturing facilities at Zybek Advanced Products. The American Society of Civil Engineers (ASCE) will hold the 13th ASCE Aerospace Division Conference on Engineering, Construction, and Operations in Challenging Environments "Engineering for Extreme Environments" on April 15-18, 2012. The Earth & Space 2012 Conference will unite engineers from all corners of the world to tackle the issues facing construction and operations in challenging environments, space exploration, and sustainable development on earth, in space, and other planetary bodies. Proceedings for the 2nd joint Planetary & Terrestrial Mining Sciences Symposium (PTMSS)/Space Resources Roundtable (SRR) meeting are now available for viewing along with a gallery of photos from the June 21st, 2011 hardware demonstration. PTMSS / SRR Preliminary Agenda. PTMSS / SRR 2nd Ann. Proceedings for the joint Space Resources Roundtable (SRR) / Planetary & Terrestrial Mining Sciences Symposium (PTMSS) are now available for viewing along with a gallery of photos from the June 9th, 2010 ISRU hardware demonstration. SRR / PTMSS Final Ann. The meeting will be held June 8 - 10, 2010 in Golden, Colorado. The Second Announcement for the joint Space Resources Roundtable (SRR) / Planetary & Terrestrial Mining Sciences Symposium (PTMSS) has now been posted and may be downloaded below. SRR / PTMSS 2nd Ann. As previously announced, the meeting will be held June 8 - 10, 2010 in Golden, Colorado. The 11th Space Resources Roundtable will be held at the Colorado School of Mines in Golden, Colorado on June 8th through 10th, 2010. Further details and an invitation for abstracts will be posted here once facilities planning has been completed. 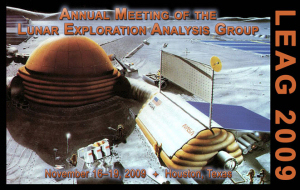 The Space Resources Roundtable will be sponsoring the November 19th events of the 2009 Lunar Exploration Analysis Group (LEAG) meeting to be held this coming Nov. 16th through 19th at the Lunar & Planetary Institute in Houston, Texas. Planned discussion will focus upon �on-ramps� for inserting lunar resources into the lunar architecture, resource prospecting, technologies and technology demonstrations, and lunar resource products and applications. � 2010 The Space Resources Roundtable Inc.